I was a big fan of Elizabeth C. Bunce's debut, A Curse Dark as Gold, which was an inventive retelling of Rumpelstiltskin set in the Industrial Revolution, so I was looking forward to more from her. And then StarCrossed came out, and though I added it to my wishlist and intended to read it, for some reason I thought it was about space and I didn't have a burning need to read it soon. Note: it's not about space, not that I think there would have been anything wrong with it if there were. But still, I had loved her fairy tale take so much and this seemed like a departure, and it slipped down the wishlist a little bit. Which is a shame, because StarCrossed may actually be better. From the very first page, when Digger is running for her life and wondering how it all went wrong, I was hooked. The scene - an incredibly intricate world that is very different from our own - is set in a matter of seconds, and it's done with skill and clarity. From the very first moment, you begin to understand Digger and her world: the danger, the fanaticism, the repressive and almost feudal setting. It all just comes to life. There is sometimes a tendency in high fantasy to become really convoluted and get bogged down in weird character and place names and intricate back stories. There is just a teeny tiny touch of this in StarCrossed (some of the names irritated me after awhile), but for the most part, there's never really a lot of confusion. Things aren't muddled the way they so easily could have been. This is helped along in part by the fact that it is a very visual novel. I've talked in reviews before about the thin line between describing a place/scene and killing the scene with too much description. Bunce understands this perfectly, I think. There is always enough description to set up the world and help the reader visualize it and understand how it looks and how it works. But she never goes overboard; she never gets mired in endless descriptions of fineries and tapestries, courtly clothing and downworld muck. She finesses the world into being so that the reader is able to just fall into it and exist in it for a bit. The world is very fully-realized and interesting. But I think what really makes this book work so well is Digger. Digger is a great main character because she's sort of an ambiguous hero. She's not quite an anti-hero, even though she's does things and makes decisions that are just not okay. She's more a sympathetic but certainly flawed hero. She's a thief and unwilling spy, but the fact that she's unwilling doesn't mean she doesn't like it - she's good at it and it gives her some semblance of power in a powerless situation. It makes her relatable, even when you kinda want to shake her. You know she cares even when she's trying not to, but she is still doing some very questionable things. And her backstory, and the glimpses you get of it through out the story - her past, her family history and lack of it, her relationship with, and fear of, magic - it all builds these layers that make her dynamic and interesting. And frankly, I just liked her. I liked her narration and her attitude, her realism coupled with a slight recklessness and fearlessnes. It all just worked to make her stand out, and to make me root for her and want to read her story. I wanted to know more about her and her world, and I can't wait to read the next book in the Thief Errant series, Liar's Moon . All in all, I feel like there's a little something for everyone in this book, and it's a highly enjoyable to book. 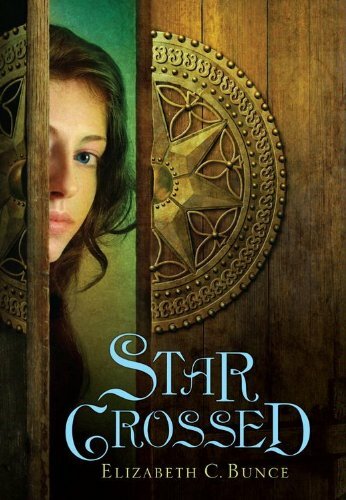 And StarCrossed is one of the finalists for the 2011 YA Book Battle over on The Shady Glade, as well as making it into my first Book Pushing vlog about my favorite recent reads! This is one of my contenders that I'm reading for the YA Book Battle. I haven't started it yet but your review makes me want to dive in. Thanks! I haven't heard of this book. I do love that it hooks you right from the beginning! Yes! Yes! Yay! :D I really liked Curse. But, I LOVED Starcrossed. Like, a lot! It's phenomenal and I'm so excited to read Liar's Moon! :) SO glad you loved this one as well!